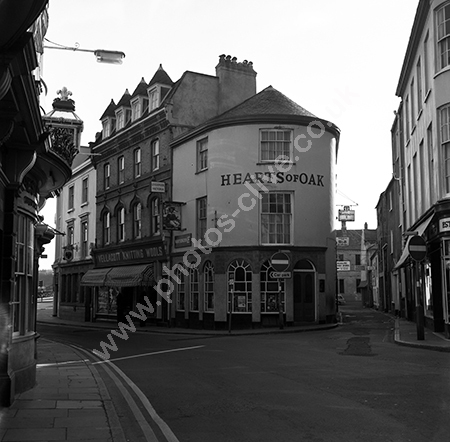 The Hearts Of Oak Pub, 70 Boutport Street, Barnstaple, Devon EX31 1HG was a pub owned by Bass Charringtons when this photo was taken in around 1973-4. At some time it was known as PVs. It became a coffee house with the name of Hearts Of Oak and re-opened as a bar in 2017. The exterior is Grade 2 listed. For commercial use of this photo, including use on another website, please visit Alamy.com and search for AEE4AT. For a one-off print please see below.